This week HLS has invited a selected group of experts to reflect upon critical issues in Scottish penal policy. Today, our post is from SPARC (Scottish Prisoner Advocacy and Research Collective), an exciting new voice in Scottish penal reform. They advocate that rather than refining the prison, making it more caring, we must remain committed, first and foremost, to reducing the prison – we cannot lose sight that prison is inherently damaging for those imprisoned there, their families and wider society. Once you are in it is difficult to get out. It is well established that prisons do not reduce re-offending. For individuals released from custody in 2014-15 (the last year where detailed statistics were published by the Scottish Government) 60% of those serving a sentence of less than three months were reconvicted. While reconviction rates for longer sentences are lower, almost a quarter of those serving between 2 and 4 years were reconvicted (Scottish Government 2017). So what effect does the prison have? The prison of course makes a massive impact on individuals, families, communities and society. Counter to current prison policy, we suggest that it is crucial to examine the effect of prison itself, rather than continuing to pathologise those within it as “bad” or “anti-social”, constantly positioning the prison as a site where these people can be repaired and from which good can flow. Indeed, there is strong evidence that criminal justice system contact can be criminogenic, with young people who are drawn into the justice system less likely to desist than those who engage in the same behaviours, but do not experience an intervention from the criminal justice system (McAra and McVie 2005). Similarly, in 2008 the Prisons Commission highlighted that even short periods in custody disrupts positive and supportive relationships in the community and, notably, that the physical geography and institutional regimes of prisons discourage independence and personal responsibility, institutionalising (and we would add traumatising) many of the people who are sentenced to this form of punishment. Imprisonment can also create or exacerbate problems relating to housing, child care, employment and discriminatory public attitudes. For instance, a 2016 YouGov survey commissioned by DWP found that that 50% of employers would not consider employing an offender or ex-offender (House of Commons Work and Pensions Committee 2016). Thus, for many people, imprisonment reinforces barriers to paid work, secure housing and personal and family wellbeing; all of which are factors supportive of desistance. An issue of particular concern to SPARC is that for those serving long or life sentences it can be incredibly difficult to progress through the system. Progression is central to how lifers and long termers are managed. Prisoners are meant to incrementally graduate to lower levels of security, ultimately as a means to test and monitor their levels of responsibility and safety, ultimately achieving parole – a process that we have elsewhere likened to a game of snakes and laddersas many prisoners are downgraded and held back. While we know that the average tariff a person on a life sentence serves has almost doubled between 2000-2012 (Howard League Scotland, forthcoming), the number of “lifers” in Scotland who are serving time over their tariff is not routinely made publically available. Our own advocacy/research work suggests that those who are most likely to experience delayed progression through the system are those who are already the most disadvantaged: those with addictions, poor mental health, difficulty building relationships with officers, those who are less able to advocate for themselves. Yet, even when people in custody do face these barriers, the availability of places on courses which are required to reduce risk or move on to the next “stage” of their sentence can create considerable delays. This raises fundamental questions about justice, fairness and what are people in prison being punished for? We contend that it is unacceptable for people to be held in custody solely for reasons relating to poor mental health, addictions or a lack of resources. This issue takes on a particular urgency and salience in Scotland because the number of sentences imposed is disproportionality high here. Speaking at the Howard League Scotland in March 2018, Professor Dirk Van Zyl Smit noted that the number of people serving life sentences has steadily risen over the last 15 years, with “lifers” accounting for 19% of the prison population. The comparable figure across European countries is 3%, with lifers accounting for 0.9% of the prison population in France and 6% in Turkey. Indeed, Scotland has more than double the number of lifers than France (1,083 vs 489). Together, the UK and Turkey have more lifers than the rest of Europe combined, including Russia. This is troubling for a country which, ten years ago, sought to position itself as in line with the apparently more progressive approach of the Nordic/Scandinavian jurisdictions. Professor Van Zyl Smit concluded that this raises questions about how Scotland responds to serious crimes and the utility of mandatory life sentences. These must be used only in circumstances where no other sentence will do, as the effects of being of life licence retain a person permanently within the criminal justice system, undermining their ability to return to “full” citizenship. The Prisons Commission was also critical of what it termed Scotland’s “warehousing problem”, or the unnecessary use of prison to hold people suffering from trauma, abuse, victimisation, addictions and poor mental health. We would agree that this is an unnecessary and unproductive use of custody which must be curtailed. However, we also want to build on this point to suggest that very often when a “care” or personal development need is identified in prison, the response is framed in terms of addressing offending behaviours e.g. expressing frustration, distress or anger may lead to a referral to anger management course; or a desire for more contact with children may lead to a parenting course. This is problematic because it has the effect of re-framing what are often structural problems such as poverty, or genuine health needs such as mental illness, as personal choices and failings (Kendall 2002); which can in turn warrant an additional criminal justice response. This is perhaps seen most clearly in the response to addictions. While we would argue this should be seen as a health issue, not least because the prison environment can exacerbate or shape drug use in particularly harmful waysfailing to manage or overcome an addiction can delay progress towards release, effectively imposing additional punishment on those with addictions. Finally, and most importantly, our reliance on prison must be reduced because prison harms. Reviews of research suggest that time in prison is itself damaging to cognitive function (Meijers et al 2015). Research on Scotland by Prof Lesley Graham has further established that those who are in prison have higher mortality rates, of two to more nearly six times higher, than those in the general population, even when controlling for social deprivation. Such work establishes, unsurprisingly, that confinement of human beings is deeply damaging, and this damage should be carefully considered. This is reflected in the higher than average rates of drug and alcohol use and poor mental health identified by the Prisons Commission. While detailed data on the prevalence of mental health problems in Scottish prisons has been argued to be lacking, research suggests that mental health is one of the most important health issues in prisons, with the majority of prisoners having at least one mental health problem[i](Gillies, Knifton and Dougall 2012). While areas of good practice have been identified, mental health services in prisons have been argued to be under-resourced, leading to significant unmet need(ibid). Mental health problems can be fatal. When we look back to deaths in custody in 2013, which is the first year in which at least some of the families in question are not still awaiting the outcome of a fatal accident inquiry, seven men committed suicide and a further two died in an “Event of Undetermined Intent/Overdose”. The deaths of these men equate to over a third of fatalities in custody in that year. Finally, prison also harms families and communities. Supporting a person in custody requires a considerable investment of time, money and emotional labour from families. Concerning, it can also create or exacerbate poor relationships between families and the criminal justice system, undermining both feelings of citizenship and penal legitimacy (Jardine, forthcoming). When we recognise this harm, we are compelled to scrutinise even the best intentioned use of imprisonment. The best way to reduce these harms is to reduce our reliance on this damaging form of punishment. Author Information: SPARC is a research and advocacy collective who campaign for reform in the use of imprisonment in Scotland, comprising researchers at all stage of career and many with long-term, personal experience of imprisonment. Jardine, C. (In press) “Eroding legitimacy? The impact of imprisonment on relationships between families, communities and the criminal justice system”, in Condry, R. and Scharff-Smith, P (eds.) Prisons, Punishment and the Family: Towards a New Sociology of Punishment, Oxford: Oxford University Press. Van Zyl Smit, D. (2018) Life imprisonment: an appropriate ultimate penalty in Scotland?, Lecture hosted by Howard League Scotland, 12 March 2018. This week HLS has invited a selected group of experts to reflect upon critical issues in Scottish penal policy. Today, Dr Beth Weaver provides a clear and critical overview of Scotland’s complex spent conviction legislation and the new proposals that are intended to improve what is an unduly harsh and punitive system of disclosure. She’s asks do the current proposals in the Management of Offenders Bill go far enough? She outlines a humane, progressive and socially just alternative form of disclosure, one that could meaningfully reform Scotland’s spent conviction legislation and make it a world leader in penal policy and reintegration. Are Proposed Reforms to Criminal Records Disclosures in Scotland Going Far Enough? What approach do other countries take? Do these reforms go far enough? Research reveals a complex relationship between (un)employment, offending and desistance but it is generally acknowledged that employment is key to desistance and reintegration (Weaver, 2015; Weaver, 2018). However, it‘s not as straight forward as getting a job and giving up crime. This is because employment in and of itself does not cause or trigger desistance; rather it is the meaning and outcomes of either the nature and/or quality of the work or participation in employment and how these impact on people’s personal priorities or goals, their self-concept and social identity (how it changes the way the person sees themself and is seen by others) and the relationships that matter to them (Weaver, 2015). Farrall (2005) also suggests that work, and as part of that, association with a new social group, can be a mechanism for rebuilding who one is and forging who one will become. So, the impact of work goes beyond the effects of having an income or even gaining a daily or weekly routine; ‘employment is part of the idea of what is acceptable’ (Owens 2009: 50), and communicates in itself, that you have a place in the world and a role to play – be it in society or even in one’s own family – as a reliable partner and provider or a good parent for example. There are many and varied obstacles to people with convictions accessing and sustaining employment, among which is the stigma of a criminal record and associated vetting and disclosure practices. Evidence indicates that anticipated stigma and the repeated encountering of obstacles to obtaining employment can increase risk of reoffending, undermining desistance (Farrall, 2002; LeBel, 2012; Winnick and Bodkin, 2008) and also, therefore, public protection. If employment can support desistance and reintegration, this would suggest that public protection is increased rather than risked when barriers to employment are removed. Indeed,there is no reliable evidence to suggest that stricter vetting practices, that create barriers to employment, enhance public protection. Underpinning much of the uncertainty around the recruitment of people with convictions is the lack of clarity as to when past convictions come to be of little or no value in the prediction of criminality, when taking into account information that is self-disclosed or revealed through formal mechanisms of disclosure. It is this uncertainty that ‘Time to Redemption’ studies seek to address. How many years of non-offending does it take for a person with convictions to resemble a person without convictions in terms of his or her probability of offending? These studies estimate that in general after an average of 7-10 years without a new arrest or conviction, a person’s criminal record essentially loses its predictive value (Blumstein and Nakamura, 2009; Bushway, et al., 2011; Kurlychek et al., 2006; 2007; Soothill and Francis, 2009; for a detailed review of this research, see Weaver, 2018). This raises questions as to why some convictions remain enduringly excluded, unspent, ostensibly for the purposes of public protection even where the evidence would suggest that the individual’s risk is statistically no longer predictive of future criminality or put differently, where that risk reflects that of the non-convicted population. Soothill and Francis (2009: 385) go as far to say that employers ‘have more to fear from the non-offending population than from those with convictions’ if those with convictions have not been reconvicted in the last ten years. How does the UK approach differ to other countries? European nations only disclose recent, unspent convictions and they tend to prevent private agencies, the media, and the general public from having access to criminal records; such information is considered private and confidential.By contrast, the UK allows for the disclosure of all convictions, cautions and police records (soft information) in certain contexts and situations, such as Standard and Enhanced Disclosure in Scotland. In this way the UK is an outlier, and the European Court of Human Rights (ECtHR) has criticised the UK system of disclosure for: providing no distinction on the basis of the nature of offence, the disposal of the case, the time elapsed or relevance of the data to the employment in question; that mandatory disclosure of all convictions is disproportionate and does not allow the exercise of any discretion to balance public protection and privacy; and that disclosure is not limited only to convictions. What reforms are being proposed for Scotland? By modifying the 1974 Act’s threshold, currently set at a custodial sentence of 30 months or longer, before a conviction never becomes spent. The Bill changes this so that a sentence of up to 48 months’ imprisonment may, in time, become spent. Do the Scottish reforms go far enough? Theproposed reforms, while welcomed, are limited. While across continental Europe, as noted above, only recent, unspent convictions are disclosed, Scotland will retain a more punitive disclosure system as the reforms pertain principally to basic disclosure: they make no direct changes to the higher level disclosure system concerning standard or enhanced disclosures.Thus some sentences will remain enduringly excluded, unspent, ostensibly for the purposes of public protection even where the evidence would suggest that the individual’s risk is statistically negated. Current legislation and disclosure practices do not reflect the evidence from Time to Redemption studies. Moreover, an excessively wide and complex disclosure system may actually undermine prospects for reintegration. The proposed changes, much like the current system, raises a number of questions about justice (Larrauri Pijoan 2014a) such as why, when some old convictions can be spent under the ROA, are they subject to disclosure when applying for a wide range of employment positions? Why are arrests, cautions and soft information disclosable when they are, by definition, judicially unproven? Scotland should adopt a holistic rather than piecemeal review of the system. This might include a system that can forget and forgive, as well as forbid participation in certain occupations and facilitate employment protection so as to promote compliance with the ECHR and allow a more rights informed and nuanced approach to the disclosure of criminal histories. Forgetting: Reviewing Spent Periods and the Disclosure of Enduringly Unspent Convictions: Scotland could legislate a) that all convictions should be subject to the possibility of being spent and b) that spent convictions should be automatically withheld from disclosure so the record is sealed and the person presumed rehabilitated for the purposes of employment. Forgiving: Certificates of Rehabilitation might be issued by the state or judicial authorities in light of concrete evidence that a person has made progress towards desistance. The certificate would effectively act as a ‘letter of recommendation’ to employers. Forbidding: Court Imposed Occupational Disqualification: at sentencing, and after an individualised assessment, a judge canprevent a convicted person from certain occupations. The idea is that employment exclusion has to be authorised in law and only in cases where there is a specific occupational disqualification order imposed by a court and not a generic criminal record. Facilitating: Providing Guidance and Revisions to Anti-Discrimination Legislation: supporting fair employment for people with convictionsmight be assisted by amendments to existing anti-discrimination legislation such as the Equality Act 2010. Currently, people with convictions appear to be the only group that are excluded from its protections. One implication might be that people with convictions should be legally recognised as a disadvantaged group entitled to special employment protection. The disclosure of criminal histories has significant impacts on access to employment and potentially on prospects for desistance. The need to bring Scottish practices in closer alignment with the European Court of Human Rights has resulted in recent and ongoing reforms to both the 1974 Rehabilitation of Offenders Act and disclosure guidelines. Research strongly suggests that proposed reforms could go further. Existing laws and reforms proposed for governing disclosure retain the requirement that some spent convictions will always be disclosed in certain circumstances, irrespective of evidence. This is likely to continue contributing to risk-averse reactions from many employers and might negatively affect people’s efforts to ‘go straight’ and undermine public protection. This would suggest that no, the proposed reforms in the Management of Offenders Bill do not go far enough because they do not address their intended purposes: reducing unnecessary barriers to employment for people with convictions while promoting the protection of vulnerable groups. Author Information: Dr Beth Weaver is a member of the Howard League Scotland organising committee. She is a leading and renowned desistance scholar and has specific interests in user involvement and co-production and the use of through-the-prison-gate social cooperative structures of employment. All of her research has an applied focus on penal reform. This week HLS has invited a selected group of experts to reflect upon critical issues in Scottish penal policy. Today, Dr Cormac Behan looks at why Scotland should lift its total ban on prisoners' voting rights. Extending the vote to prisoners is not simply about criminal justice, penal reform or rehabilitation. This is about human rights, creating a universal franchise for all adults in Scotland, and ensuring democratic rights for all citizens. In January 2018, I was invited to give evidence to the Scottish Parliament’s Equality and Human Rights Committee on prisoner voting. I presented the Committee with my research about prisoner voting internationally, with particular reference to the Republic of Ireland. In my evidence, I put forward the arguments in favour of allowing prisoners’ access to the franchise, which cover a range of issues from democracy to citizenship to reintegration. Research has indicated that there are strong arguments and evidence that prisoners’ maintaining a link with society outside, and in particular with their local community, can act as a spur towards reintegration. It might be one of the ‘hooks for change’ which scholars have identified are important in encouraging desistance from crime. To remove the right to vote – one of the most important elements of citizenship – adds to the dislocation from, and disconnection with, the world outside prison walls. It creates another layer of punishment beyond the denial of liberty, becomes an instrument of social exclusion, and can have significant longitudinal consequences in voting among ex-prisoners. To deny the right to vote not only undermines an individual’s citizenship, it can weaken the fabric of communities that have greater proportions of their citizens incarcerated. Citizens bring rights with them to prison set out in domestic law, various policy documents and international agreements. The European Court of Human Rights in the Hirstcase ruled that: ‘Prisoners in general continue to enjoy all the fundamental rights and freedoms guaranteed under the Convention save for the right to liberty, where lawfully imposed’ (Hirst v United Kingdom (No. 2),2005). Unless there are substantive reasons otherwise, it can be argued that imprisonment should not remove the right to vote. Imprisonment is about the loss of liberty, not the loss of citizenship and voting is a cornerstone of citizenship in a modern democratic polity. The concept of civic death on which the denial of the right to vote to prisoners is predicated is an antiquated notion and considered an outdated idea in a modern democracy. Some of those who oppose enfranchisement are concerned that allowing those who have broken the law to decide who should make the law undermines the democratic process for all. I presented evidence from my research in the Republic of Ireland that enfranchisement has not weakened the democratic process. During the debates in the Oireachtas (Irish parliament) in 2006 to enfranchise prisoners, arguments were advanced that this would strengthen the polity rather than damage it. Removing the right to vote not only undermines the social contract but damages the social compact on which community and citizenship is constructed. While prisoners may have broken the social contract and therefore, argue proponents of disenfranchisement, voluntarily put themselves outside the social order, others who have damaged the social compact are less likely to appear before the courts and subsequently end up in prison and therefore be denied the franchise. While it is argued that governments have an obligation to those who obey the law to punish those who break the law, this fails to locate the law in a wider social and political context. The denial of the vote to a prisoner for the duration of a sentence is also related to the timing of an election. If an individual is serving a sentence on election day for a minor offence they may be denied the opportunity to exercise their franchise. An individual could serve a number of years in prison for a more serious offence and still have the opportunity to vote, if they were no longer incarcerated on election day. If voting is one of the most important elements of the social contract, then these considerations make denying it in this context somewhat arbitrary. It is imprisonment that will decide if a prisoner keeps or loses their right to vote rather than their receiving a conviction and many of those found guilty in the courts do not receive a custodial sentence. In the Hirstcase, two judges of the European Court of Human Rights observed that, ‘the reasons for handing down a custodial sentence may vary. A defendant’s age, health or family situation may result in his or her receiving a suspended sentence. Thus the same criminal offence and the same criminal character can lead to a prison sentence or to a suspended sentence’ (Hirst v. United Kingdom (No.2), 2005). They concluded that the reason the right to vote is denied ‘is the fact that the person is in prison’. In different jurisdictions, two individuals may be convicted of the same crime, and one may be sentenced to a term of imprisonment and not allowed to vote, while the other receives a non-custodial sentence and can exercise their franchise. “144. Consequently, given the evidence we have heard, and the fact that many other countries have followed this approach with little in the way of problems (including a neighbouring country with similar legal and political traditions such as the Republic of Ireland) we think there is a strong argument that Scotland should aim for a higher standard than recently established at UK level and should therefore legislate to remove the ban on prisoner voting in its entirety. “146. In taking forward this recommendation, we ask the Scottish Government to consider a plurality of views on the issue and consult as wide a range of stakeholders as possible, including victims of crimes and the general public”. There is currently a window of opportunity in Scotland to make these chnages happen. All members and supporters of Howard League Scotland now have an opportunity to contribute to these consultations and make the Scottish government aware of your views on prisoner enfranchisement. Author Information: Dr Cormac Behan is a Lecturer in Criminology in the Law Department at the University of Sheffield, prior to which he taught political education and history in Irish prisons for 14 years. He is a leading expert in prisoner voting and was recently invited to give oral evidence to the Equalities and Human Rights Committee of the Scottish Parliament. Jamie Greene MSP and Annie Wells MSP dissent from paragraph 144. Jamie Greene MSP and Annie Wells MSP dissent from paragraph 145. This week HLS has invited a selected group of experts to reflect upon critical issues in Scottish penal policy. Today we look at the road to prison. Professor Susan McVie and Dr Ben Matthews, researchers from the Understanding Inequalities project, ask what is the relationship between Scotland’s staggeringly high use of imprisonment and poverty? (Scotland's imprisonment rate is 143 per 100,000 of national population, one of the highest imprisonment rates in Europe). But they push us further, encouraging us to carefully and critically think about how studying crime and inequality can inadvertently stigmatise the poor and marginalised. In 2005, Roger Houchin foundthat the links between social exclusion and imprisonment in Scotland were so strong that the best strategy to tackle offending behaviour lay in tackling social exclusion. In 2008, the Scottish Prisons Commission agreed that the prison population was over-represented by people from the poorest communities, and recommendedsignificant changes to the use of imprisonment in Scotland. But 10 years on, what progress has been made? The ESRC-funded Understanding Inequalities project aims to explore the causes and consequences of inequalities in Scottish society.As part of our work on crime and justice inequalities, we revisited Houchin’s report to see whether the relationship between inequality and imprisonment in Scotland still held, especially given the substantial falls in crime in Scotland over the past 15 years. Specifically, we wanted to see if two of Houchin’s conclusions from 2005 were still valid. Firstly, that there was a ‘linear’ or straightforward correspondence between the level of deprivation in an area and its rate of imprisonment. And second, that deprivation was ‘neither a necessary nor a sufficient’ explanation for rates of imprisonment. We looked at data on Scottish prisoners from one night in 2014 and examined the datazones (a proxy for neighbourhoods) in which their last known address was registered. Houchin’s conclusions were based on a similar dataset, although there were some differences in methodologyso our results are not directly comparable with his at the neighbourhood level. Nevertheless, we can compare our findings with Houchin’s for the whole of Scotland. Let’s consider Houchin’s two propositions in turn. To do this, we examined inequality in the rate of imprisonment per 1,000 people in each of Scotland’s 6,976 datazones (to enable comparison across different neighbourhoods). Our measure of inequality was the Scottish Index of Multiple Deprivation (SIMD), a routinely used measure of deprivation which ranks Scotland’s datazones from 1 (the most deprived neighbourhood) to 6,976 (the least deprived neighbourhood). Proposition 1: There is a linear correspondence between level of deprivation and imprisonment. There are some caveats, however. 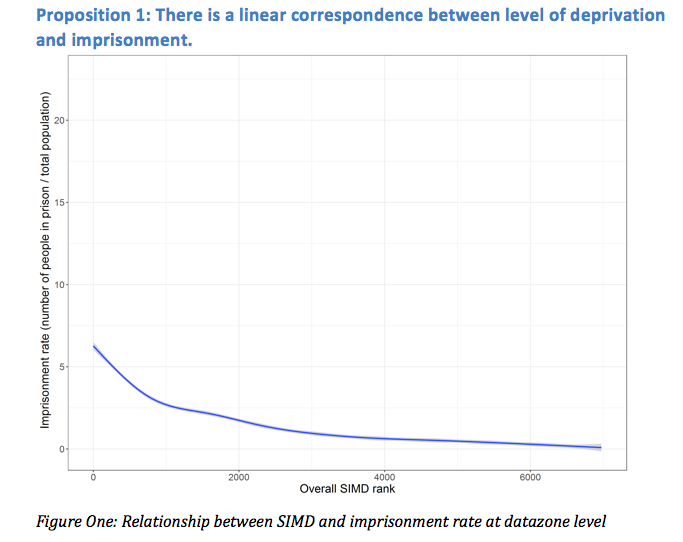 First, we can see that the relationship between the imprisonment rate and SIMD may be better described as a non-linear correspondence than a linear one- the blue line isn’t straight, it curves upwards towards the left-hand side of the graph. This means that the difference in the ‘best guess’ of the imprisonment rate between, say, the 100th most deprived datazone and the 200th most deprived datazone is not the same as the difference in the ‘best guess’ imprisonment rate between the 200th and 100th least deprived neighbourhoods. In other words, imprisonment rates in the most deprived neighbourhoods of Scotland appear to be disproportionately higher than those in the most affluent neighbourhoods, based on their levels of deprivation alone. 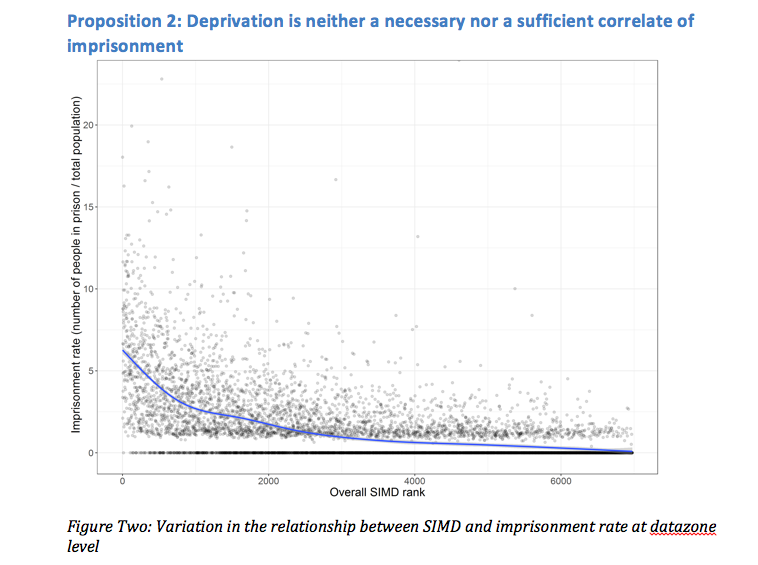 Houchin’s second proposition was that the averagerelationship between imprisonment rate and deprivation (shown in Figure One) did not show the whole picture. To test this, we added the actual imprisonment rate for each individual datazone to Figure Two. Each dot represents a single datazone in Scotland and, as you can see, the dots do not all cluster around the blue line (the best guess of the imprisonment rate based only on SIMD). This suggests that there are other factors that affect the imprisonment rate of a given neighbourhood rather than just deprivation. The wide spread of points around the line also indicates that neighbourhoods with similar levels of deprivation can have very different imprisonment rates. For example, within the 10% most deprived neighbourhoods the maximum imprisonment rate was over 22 per 1,000 people and the minimum imprisonment rate was zero. However, within the 10% least deprived neighbourhoods the maximum imprisonment rate was 3.75 per 1,000 and the minimum rate was zero. In other words, the imprisonment rate is lower in some of the most deprived neighbourhoods in Scotland (as measured by SIMD) than it is in the least deprived neighbourhoods in Scotland. Houchin’s second proposition, therefore, is correct. So has anything actually changed in the years since Houchin’s report? Based on our analysis, Houchin’s conclusions about the relationship between social exclusion (or inequality) and imprisonment still provide a reasonable description of the relationship between area-level deprivation and area-level imprisonment rates in Scotland. On average there is still a ’correspondence’ between deprivation and imprisonment - and this should be a concern for those interested in prison reform and issues of inequality more broadly in Scotland – however, it is clearly not the only factor that influences whether someone ends up in prison or not. In order to properly understand the relationship between imprisonment and inequality in Scotland today, we need to take Houchin’s propositions further and examine the extent to which multiple forms of inequality intersect to impact on people’s life chances. In her careful reflection on Houchin’s analysis, Sarah Armstrong cautioned that “killer stats”, like those from Houchin’s report, can “lock in certain ideas and associations… making it difficult to understand the problem in any other terms.” Armstrong warned that if we only focus on the correspondence between deprivation and imprisonment, when we hear the word ‘prisoner’ we will automatically visualize a ‘poor’ face - when the reality is much more complex. We also need to remember that there are very deprived neighbourhoods in Scotland where imprisonment rates are much lower than those of more affluent areas. At a simple level, it is true that people living in Scotland’s most deprived communities are disproportionately more likely to end up in our prisons. But, as we have shown here, visualizing the data in more detail enables us to see that there is a much bigger, more complex, story to be told. It is this that the Understanding Inequalities project aims to do in the coming years. Author information: Professor Susan McVie and Dr Ben Matthews work on the ESRC-funded Understanding Inequalties project at the Univeristy of Edinburgh. The Understanding Inequalities project has been funded by the ESRC (Grant Reference ES/P009301/1) for three years from October 2017. It involves an international team of researchers led by the University of Edinburgh. The Applied Quantitative Methods Network analysed different aspects of the crime drop in Scotland, including trends in victimization, the spatial distribution, and patterns of convictions. There’s a helpful, if rather technical, discussion of these methodological challenges on Wikipedia. We calculate this as a rate by dividing the number of people in prison with a home address in each datazone by the total datazone population. It’s important to remember that we only have data on numbers of people in prison, not offending, conviction, policing, reporting, sentencing or any other factors which may affect the numbers of people in a given neighbourhood who were in prison on the night this dataset relates to. Statistically-minded readers will have noted that whether fitted values from a statistical model are linear or non-linear will depend on the model specification used. We compared the statistical fit of a model which allowed the relationship between imprisonment rate and Overall SIMD to be non-linear to a model which only allowed a linear relationship, and found that the non-linear model did a better job of describing the data. This week, HLS has invited a group of leading experts to reflect upon critical issues in Scottish penal policy. Below, Dr Katrina Morrison argues that we can make prisons more humane by professionally evolving the role of the prison officer, who can and should be someone who is trained to support people in custody. In efforts to reduce the carceral net, and to make prisons better places for those held in custody, I want to argue that those interested in penal reform should also pay attention to the staff who work within prisons. If we want to minimise the harms of imprisonment as much as is possible within an institution that is coercive and inflicts pain, we must not forget those who give shape to the practices and experiences within the organisation. This may be especially important in an organisation in which its objectives are so conflicted, and the emotional dimensions of the work so heightened. It is therefore important that penal reform should also include those who work within prisons within their remit, as well as on those who are in custody. Supporting staff in prisons, whether this be through better education, training or improved working cultures, may not initially seem like it should be high on the list of priorities for penal reform. However, progressive penal reform must also celebrate and support an investment in prison officers, in order that they be better placed to support the aspirations of imprisonment to care for those in custody and not be solely attentive to managing risk and ensuring less eligibility within prisons. Ultimately, it is prison officers who can support a return to citizenship, and the importance of this role has tended to be overlooked in the Scottish context. Investing in better prisons – putting lipstick on a pig? Arguing that penal reform should include attention on prison staff (implying investment of time and financial resources), may be difficult for some to agree with. This perhaps reflects a wider debate between penal reductionism and penal abolitionism, and whether it is possible to accept that there could ever be such a thing as a ‘good’ prison. Some may argue that investing in prisons, whether the buildings, conditions, or staff, is like ‘putting lipstick on a pig’. Whether prisons can ever be ‘normalised’ is long debated within criminology, but I take the view that, while prisons exist, they must be supported to do what positive work they can. This is within the boundaries of an institution which is fundamentally organised to inflict psychological, if no longer physical, harm (Crewe, 2011). There is of course a danger in investing in prisons to improve the conditions therein. Investing in prisons leads to prisons being recast as places of care, respite and rehabilitation, with a real danger that the judiciary will send people there forrespite and care, when other non-custodial sanctions would be more suitable. Traditionally, this has particularly been an issue for the female population, and this is a delicate balance which must not be forgotten as the women’s estate is reconfigured and the Community Custody Unitsare built. Prison should never be an option where people are sent for rehabilitation. The aims of imprisonment will always be multiple and complex, but prisons must also be able to support desistance by building hope, as well as providing access to services which support improved health, employability etc. both within and after prison. While care canand shouldbe provided in prison, it must nonetheless never be forgotten that prisons will also always be places of punishment, dislocation, and separation. The deprivation of liberty, control over movement, removal of key tenets of citizenship (ability to work, to vote, limit of family life and relationships), will always be the imposition of pain, no matter how positive the penal regime. Officers perform tasks underpinned by conflicting rationales, in a demanding environment with some of the most vulnerable and challenging individuals in our society. Officers are required to monitor risk and security and to maintain order, whilst at the same time empathising, supporting, building hope, and demonstrating personal resilience (Crawley, 2004; Bennett et al., 2008; Liebling et al, 2010). The balance between ‘custody’ and ‘order’ with ‘care’ and ‘opportunity’ requires officers who can think critically about imprisonment and who can care in the most challenging contexts. Following the publication of the Organisational Review in 2013, it is now recognised that staff must have the right knowledge, understanding and skills so that they too can support the positive change of those in custody (SPS, 2013). Since then, reforms aimed at professionalising the service are underway in order to create a degree of skill and professionalism that has not before existed in the prison setting’ (SPS, 2016:1). In the future, prison officers are expected to play a central role in helping to ‘unlock the potential’ of those in custody, by taking a greater role as: ‘counsellors, role models, coaches and advocates of the people in their care’ (SPS, 2016). Professionalising prison officers is not a new agenda for the Scottish Prison Service. In 1991, Andrew Coyleclaimed that ‘we may now be at the beginning of a fundamental reassessment of how the prison officer carries out this task. In the not too distant future the prison officer might properly be described as a professional worker’ (p242). Over 25 years later, the inclusion in the 2017 Programme for Government of professionalization within the SPS, has put it firmly at the centre of Scottish prisons policy again. There is no single definition of professionalism, but two key aspects of ‘professional practice’ are the ability to make ‘complex decisions’ drawing on ‘technical knowledge, skills and informed judgement’ (Sullivan, 2005), adherence to an ethical code which can be enshrined in a (regulated) code of practice, and engage in specialised formal learning throughout their career (Sparks et al, unpublished). Within a prisons setting, professionalization can mean different things. According to Crawley, professional prison officers do their job in a ‘fair, legal, confident and neutral manner’ with the ability to ‘relate to, and deal with difficult, truculent people’ (2004: 112). Liebling et alcite Gilbert’s definition of ‘the professional’ prison officer as ‘open and non-defensive, makes exceptions when warranted, prefers to gain cooperation and compliance through communication, but is willing to use coercive power or force as a last resort’ (1997, in 2010). For Sparks et al (unpublished), professional prison officers are able to form the right sorts of relationships and to work in and through these relationships to support desistance, which require both the right ‘personal qualities and values’, and a ‘wider body of knowledge’ relating to crime and desistance. What is clear, is that the ambitious aspirations for the SPS contained in the Organisational Review, have to place staff at the core of organisational change. Supporting staff within prisons to do their job to the best of their abilities, is compatible with an associated concern with people in custody. For those who want to reduce Scotland’s extensive penal state and radically improve penal outcomes, these concerns are symbiotic. Author bio: Dr Katrina Morrison is a lecturer in Criminology at Napier University and was a part-time Learning and Development Researcher with the Scottish Prison Service, developing prison officer professionalization.